Tapping provides the emotional freedom to move forward in every area of your life. Tap away your stress, anxiety and fear and live life with clarity and peace of mind. Try the FREE step-by-step tapping guide and video tutorial of tapping sequences to erase stress, anxiety & fear… in just minutes. Thought Field Therapy® provides a code to nature’s healing system to give emotional freedom from worry, stress and anxiety. Discover How You Can Be Free from Stress Anxiety and Fear in Minutes! TFT Tapping balances the body’s energy system and allowing you to eliminate most negative emotions within minutes. 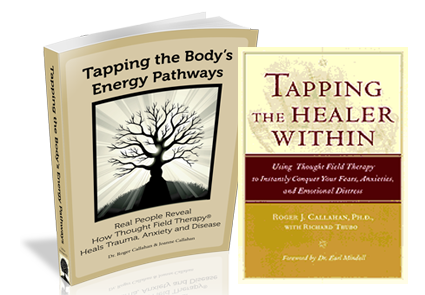 Books by TFT Tapping founder Dr. Roger Callahan. Thought Field Therapy (TFT) has changed the way thousands of people have overcome emotional problems. Harness its healing power on your own to overcome phobias, anxieties, addictions, and other common psychological problems… from the founder of tapping. … Learn to use TFT to help yourself and others! 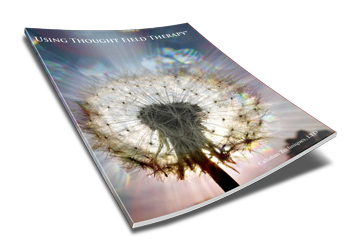 Thought Field Therapy (TFT) provides a code to nature’s healing system. When applied to problems, TFT solves the fundamental causes, balancing the body’s energy system and eliminates most negative emotions… within minutes. Dr. Roger Callahan, our founder, achieved worldwide recognition, acceptance and use of Thought Field Therapy. We believe we can have a significant impact on the decrease of human suffering if everyone has these tools at their disposal. TFT tapping is a brief, effective psychotherapy for the rapid and natural healing of negative emotions and psychological problems. Thought Field Therapy uses nature’s therapeutic system to balance the bodies energy system promoting natural healing and improved mental health. 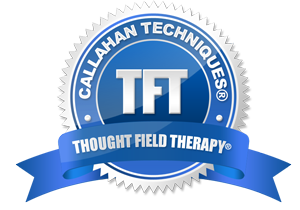 Callahan Techniques® Thought Field Therapy is a natural, drug-free approach with rapid results that can be documented with Heart Rate Variability measurements. Callahan Techniques® training is offered to professionals in the energy healing and alternative medicine as well as traditional healthcare fields. The healing world of Callahan Techniques® and Thought Field Therapy® spawned the beginnings of many therapies, often collectively called Energy Psychology and also called EFT. Most have a basis in the original form of Thought Field Therapy, and, together have all performed a tremendous service to improve the effectiveness of healing and the field of psychology. It began in 1980, when psychologist Roger Callahan and a patient with an extreme phobia of water. Mary’s fear of water controlled her life and kept her from daily activities. She was unable to take her children to the beach and was unable to drive near the ocean; she grew fearful when it rained, and could not even withstand the sight of water on TV. She had vivid nightmares involving water. Based on this discovery, Dr. Callahan began a series of investigations to develop and refine this technique, which he termed Thought Field Therapy. Thought Field Therapy (TFT) is often confused with Emotional Freedom Techniques (EFT). However, the two actually have a few significant differences. Today, we’re going to uncover the differences between the two. Remember: the only evidence that matters is you own experience- do what works for you to end useless pain and suffering. First, let’s talk about what the two techniques share. Both TFT and EFT involve tapping on specific points on the body while focusing attention on a specific emotion or problem. They also mostly use the same tapping points. The purpose of both methods is to overcome negative thoughts and traumatic memories. Now, let’s look at a few differences between TFT and EFT. TFT came first: Thought Field Therapy was developed by Roger Callahan after he discovered innovative applications of kinesiology and meridian therapies. Emotional Freedom Technique was developed by Gary Craig after studying extensively under Roger Callahan. TFT is more varied: EFT is often promoted as a “simplified” version of TFT. Yet it takes no longer to do TFT than EFT. TFT does not require you setup phases to be repeated as you tap. Where TFT provides a different set of unique tapping patterns (algorithms) for each problem category, using different tapping sequences for different triggers or emotions, EFT uses the same generalized sequence every time, regardless of the issue that needs to be addressed. TFT instructs users to stop if it is not working after a couple of attempts and move on to other TFT techniques that are needed. EFT instructs users to keep doing it regardless of ineffective outcomes. TFT places a much higher priority on the tapping sequence itself: In EFT, all the acupuncture points are tapped, regardless of the problem, with the assumption that you’re going to eventually end up tapping the spot that correlates with that emotion or trigger. TFT provides different sequences using a variety of acupuncture points for each category of triggers. TFT is constantly growing and developing: Roger Callahan continued to develop TFT all the way up until his death. Because of the vast number of potential tapping sequences, it is possible for TFT to continue growing to include even more new sequences. EFT has only one “default” method that is supposed to cover every trigger and emotion. When required TFT has more advanced ways to determine the precise tapping needed. EFT uses the same pattern over and over regardless of its effectiveness. TFT doesn’t require you to endlessly talk about your problems: When using EFT, you have to voice the problem you are experiencing while tapping every point from top to bottom. In TFT, the person receiving treatment only needs to think about their trigger and remember how it made them feel in order to use the tapping sequences effectively. TFT is the only tapping therapy rated as effective by the national registry of evidence based programs and practices. Fundamentally, EFT is a “one size fits all” approach to managing traumatic memories, triggers, and negative emotions, while TFT is a more customized approach that gives you the ability to really focus in on specific emotions and triggers when you need to. EFT promises a “simplified version” of Roger Callahan’s TFT techniques; however, we have learned over years and years of using TFT algorithms that there truly are certain sequences and tapping points that are more effective for finding relief and freedom in each category of problem. Most TFT practitioners take the techniques they learn and implement them in ways that are unique to their own methodology. One of the great things about TFT is that it can be used in combination with any number of other therapies which allows for practitioners to find the way that works the best for them. Most tapping techniques are based on the original Thought Field Therapy techniques developed by Roger Callahan, and the continued development of new methods of implementation has greatly improved the effectiveness of alternative healing. 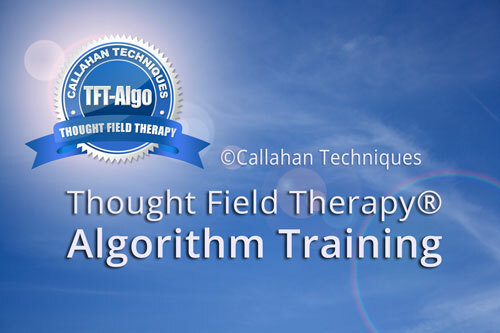 New: The Official Thought Field Therapy® Online Algorithm Course – Learn all of the Thought Field Therapy Algorithms at home, and get TFT certification. Click here for details on our TFT-Algorithm Course. Check Out All TFT E-learning Courses! Instant Relief and Emotional Freedom For Stress-Free Living. Try The Original Tapping Therapy From The Founder Of Tapping… Get Relief From Anxiety, Fear And Stress In Just Minutes! I have been using TFT Tapping Therapy for only 3 days, and am already seeing results in my ability to handle stressful situations, without allowing it to take me off course. Very easy to follow, takes less than 5 minutes, yet the results are very powerful. I am very grateful for this program! – Louise S.